Home › Dog behavior › Walking the dog has big impact! Walking the dog has big impact! As Dr. Oz says, let’s go out for a half hour walk every day. It helps with our blood circulation, muscle development and general well being. Walking also produces endorphins, which help us feel good and alleviate stress. But instead of going outside, in the neighborhood or local park, many times we choose using treadmills or going to the gym to help us fulfill the needed exercise. What about our dog? Doesn’t Dr. Oz’s advice apply just as much to our dog as it does to us? What happens to Fido when we’re on the treadmill or in front of the TV? 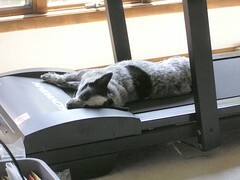 One way that we have found to get our dogs’ need for activity fulfilled is to put them on treadmills too. The treadmill trend is so strong nowadays that there is a market just for ‘dog treadmills’. There’s nothing wrong about looking for ways to help our dog relieve some of her excess energy. After all, as we all know, ‘a tired dog is a good dog!’ Twenty minutes on the dog treadmill will burn off some of that excess energy, no doubt, but although we would love to just relax after a hard day of work, nothing can replace a walk because it provides much more than just physical activity. A walk in the park gives our dog mental stimulation, social contacts with other dogs and people, as well as quality interaction with us. The outside world is full of new smells, different sounds and situations: a child running by, a strange dog on the other side of the street, a squirrel climbing up a tree, an ambulance speeding away with all sirens blasting, bicycles, people laughing, playing, roller skating, … There are so many different situations, familiar or strange, predictable or not, that we’re so used to seeing on a regular basis, that we forget that for the dog, they can be overwhelming and uncomfortable unless she has been exposed to them on a regular basis. Just 20-30 minutes 5 times a week makes a big difference. Socialization at an early age is critical for the dog to develop into a confident and well adapted animal, but unless we keep exposing him to the outside world, the dog may still become fearful and reactive to minor changes. Sudden noises or movements can be scary to a dog that hardly makes it out of the house and the backyard. The more the environment is limited, the fewer opportunities for the dog to develop coping skills and habituate to normal changes, like different noises or movements. Learning how to adapt to a variety of situations as well as to potential changes in the environment is also what contributes to the development of neural pathways and problem solving abilities. Walking through different places, parks and streets, provides an array of stimuli that just can’t be found in the confinement of our homes and that a treadmill certainly cannot replace. We can imagine that if we were confined to our house, our own mental faculties would be affected. A study from the Research Center for Human Animal Interaction, led by Rebecca Johnson of the University of Missouri, showed that the difference between walking a dog or not is truly significant (Johnson, 2010). The study was designed to measure the impact of walking dogs on their behavior and social skills and whether or not this would improve their chances of being adopted versus euthanized. Shelter dogs were divided into two groups. The first group was walked 5 times a week and the second group simply stayed in their runs. The results showed that when walked, the dog’s behavior and sociability were greatly improved, so much so, that 75% of those dogs found a home. As a comparison, only 35% of the control group was adopted. If you’ve travelled overseas, you’ve probably noticed a major difference between American dogs and European dogs. In Europe, dogs are everywhere, in restaurants, parks and public places, on or off leashes (See blog: ‘Paris, a city of dog lovers‘). I’ve heard many comments over the years about how well-behaved European dogs seem to be. Having lived and worked with dogs on both continents, I can attest to the fact that most owners in Europe don’t take their dogs to training classes and aren’t more dog savvy than American owners. So what makes the difference? Why do European dogs seem to get along with one another so much better and appear to be generally better behaved than dogs in the US? Based on my personal experience, the biggest difference: they are walked on a regular basis! When most people live in apartments, they have no other choice than to walk the dogs at least 2-3 times a day. We all know that walking a dog is beneficial to both the dog and ourselves, but we tend to underestimate how much of a difference it really makes. Many of us feel overworked and tired and walking the dogs can feel like yet another chore. When choosing not to go out for a walk, however, it’s important to understand that we’re not only missing an opportunity for both ourselves and the dog to exercise, we’re also limiting his exposure to the world. By doing so, we’ll increase the chances for behavior issues to develop. We fall into a vicious cycle, where on the days that we finally decide to take the dog out for a walk, we’re struggling with excitability, lunging, barking and reactivity from the underexposed and under trained pooch. When walking several times a week, the dog becomes more social, more confident and has the opportunity to learn how to walk on a leash. Walking becomes easy and pleasant, healthy and stress relieving for everyone when done regularly. Are dogs in Europe better behaved than dogs in America? Is It Cruel Not to Walk Your Dog? ‹ August 26th – It’s National Dog Day! 3 Pings/Trackbacks for "Walking the dog has big impact!"